Sweet and Sour Pork is a Cantonese dish, starting as early as Qing Dynasty. At that time, there were many westerners coming to Guangzhou. They liked Chinese food. One of their favorite is Sweet and Sour Pork Rib, but they don't like the bone. The Chinese chefs then took out the bone. It became today's Sweet and Sour Pork. The chefs called it "GuLao Rou" meaning it had a long history. Later because of the pronunciation, the name became "Gulu Rou". You can find Sweet and Sour Pork world widely. The taste and flavor varied in different restaurants and different places. In America it's more sweet than that in China. Many years ago I studied in the US and worked as a part time waitress. I remembered this dish was ordered frequently. One guy gave me very deep impression. After meal, he patted his already very big belly, said with satisfaction, "So...delicious!" In many big banquets in China, Sweet and Sour Pork is a must ordered dish. But I don't like this dish made by restaurant. I don't know it's whether from the cost or the taste, they put many wheat flour on the surface of the meat. It likes deep frying a piece of dough. And the left little meat contains much fat. So what I can eat is only that layer of wheat flour and it's deep fried- unhealthy at all! Once my Mom cooked stir fried pancake (made of wheat flour, hard). Both of us found it tasted like the deep fried meat made in restaurant. You can imagine how much they put flour on the meat. However, you can buy pork lion and cook at home. It's really delicious. 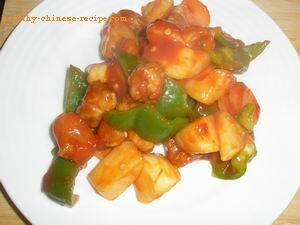 The tastes of Sweet and Sour Pork is sweet containing sour with a little spicy which is brought by the pepper. Inside the sweet& sour flavor is fragrance meat, crispy outside layer (you even can hear the crunchy sound when biting) but tender inside. When preparing this dish, two stages are very important: making perfect sweet and sour sauce; coating enough starch powder and deep frying two times to make sure the outside layer is crisp. There are three steps when coating: The first step is wet starch. This is made when marinade. Then coat a layer of egg liquid which can make the meat tender. At last coat a thick layer of dry starch which will make the meat crisp when deep fry. Deep frying is not healthy. I invented an alternative healthy way to make deep fried Chinese food: by baking. Before deep frying, all the processes are the same. Clean, cut, and coat. Baking can make the surface layer crispy. I replaced dry starch powder with crumb which becomes more crispy. You don't know how excited the first time I cooked it by using this healthy way! Because the food keeps the same flavor and the crispy texture. No one could think of it was baked. Please see my Sweet and Sour Chicken Recipe, and non-deep-fry Sweet and Sour Pork Recipe Here is classic Sweet and Sour Pork but I only deep fried one time.